The new Honda CRF450RX for 2017 has drawn its inspirations from both CRF450R and CRF450X. The features of both these models have been combined in this all-new bike to give you all that you had desired in an endure bike. Here is a brief review of this 2017 model to make up your mind in case you are planning to buy one. The frame of this 2017 Honda CRF450RX boasts of a frame made of 7th generation CRF aluminium beam. The frame offers features like improved traction, front-end stability and turning performance. The frame also ensures more use of rear wheel drive so that there is a higher degree of predictability and rider feedback. The torsional stiffness of its main spars has been lowered by 6.8 percent so that the turning feel and the ability are improved. The weight of the frame is 20.2 lbs and that of its extruded rear subframe is about 2.3 lbs. The height of its centre of gravity is about 2.7 mm lesser. The distance between the bike's swing arm pivot and front wheel axle is about 913 mm. Due to this specific geometry, more weight gets transferred to its rear wheel to achieve outstanding traction. The bike's seat is at a height of 37.8 inches. 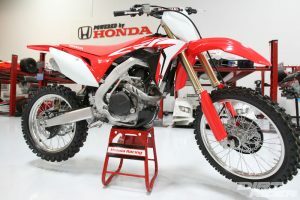 The all-new Honda's CRF450RX is a compact and slim bike, which is easily manageable due to the center of gravity's low height. The model's rear tire matches the grip level of the front end and accurate feel for the traction. The 449cc engine of the new CRF450RX has the same specification as that of the engine of the new CRF450R. But the former has got a boost of 11 percent in its top-end power for the model year 2017. However, it still retains its trademark torque and power delivery in the entire range. Its compression ratio is at 13.5:1.There is a 4-valve cylinder head and the diameter of the inner valve is 38 mm. There is a smooth gas flow due to the 2-way valve seat. The bike's engine distributes oil for the clutch and the transmission through a scavenge pump. The pump also helps to improve the lubrication efficiency, reduces pumping losses and lowers friction. Oil capacity of the bike is1250cc and one sump stores oil for the gearbox, clutch, and engine. Thus, the above discussion goes on to show that Honda has come up with a genuine, all-new and competition-ready Enduro bike that shares the features of the new engine of CRF450R. The model's displays, as well as controls, have been rationalised and positioned on its left handlebar. The button for engine start/stop, an electric starter, LED indicator, EFI warning, and the EMSB mode button has made it extremely easy to restart when the engine is stalled, especially when you are riding on tracks that have uneven and rocky surfaces. The EMSB feature enables an instant adaptability of the engine at the command of the bike's rider. If the bike is stopped and the engine is at an idle state, you need to simply press and hold the button for a second or so to select the subsequent map in the order.